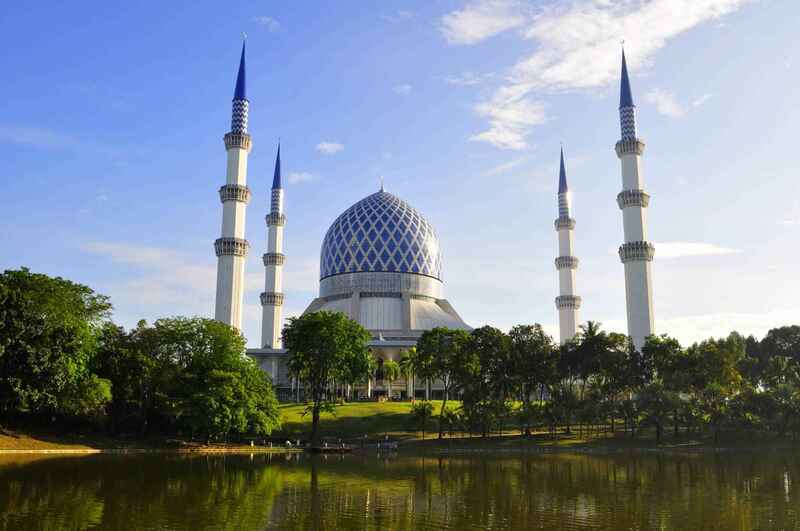 The Sultan Salahuddin Abdul Aziz Shah Mosque is the state mosque of Selangor, Malaysia. It is located in Shah Alam. It is the country's largest mosque and also the second largest mosque in Southeast Asia after Istiqlal Mosque, Jakarta in Indonesia. Its most distinguishing feature is its large blue and silver dome. The mosque has four minarets, one erected at each of the corners. The architectural design of Sultan Salahuddin Abdul Aziz Shah Mosque is a combination of Malay and Modernist style. The mosque has the capacity to accommodate 24,000 worshippers at any one time and is large enough that on a clear day it can be seen from some vantage points in Kuala Lumpur. The main dome of the mosque measures 51.2 m (167 ft) in diameter and 106.7 m (350 ft) in height from the ground level. It is constructed primarily from aluminium. The minarets are placed at each of the four corners and are 142.3 m (460 ft) tall. Elements of Malay and Islamic architecture are incorporated into the finishes of the building. Fine decorative khat (Arabic calligraphy) can be seen on the inner curve of the dome and parts of the walls. The calligraphy work was executed by the Egyptian calligrapher Shiekh Abdel Moneim Mohamed Ali El Sharkawi. Aluminium grills of intricate design can be found on the doorways, windows and walls of the Mosque. The windows are fitted with blue stained glass to reduce the amount of light that can enter the hall. The resulting filtered illumination renders a bluish ambiance to the interior spaces evoking a sense of peace and serenity. The high ceiling has triangular panels of red balau and ramin timber wood that are set in crisscrossing pattern. The dome is constructed of aluminium and the outer surface is clad with vitreous enamel-baked triangular steel panels decorated with a rosette of verses from the Qur'an. The main prayer hall is over two levels, is fully carpeted and air conditioned and is one of the largest such spaces in the world. The upper gallery of the prayer hall is reserved for the use of female worshippers. The second floor houses a gallery, the ground floor contains the administrative office, conference rooms, library, reception and lecture rooms. The Blue Mosque overlooks the Garden of Islamic Arts, a landscaped park inspired by the Quranic Garden of Paradise (Jannah) (Arabic: جنّة). This 14 hectares of spiritual sanctuary houses nine galleries exhibiting a rich array of Islamic arts such as calligraphy, sculptures, paintings and architecture. The site is occasionally used for traditional Islamic performances. 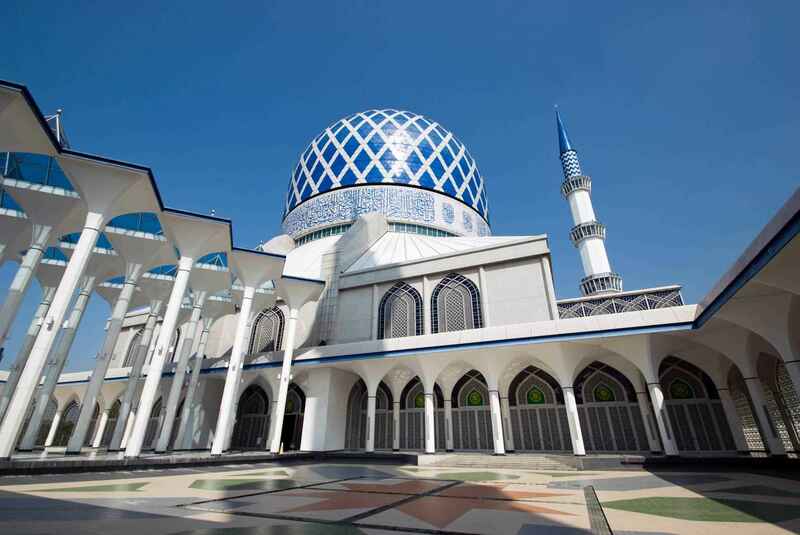 Sultan Salahuddin Abdul Aziz Mosque | eTips Inc.